As an ASEAN member country, Indonesia formulates its cosmetic regulation in accordance with ASEAN Cosmetic Directive (ACD), in line with these requirements Indonesia adopts a notification system for cosmetics. 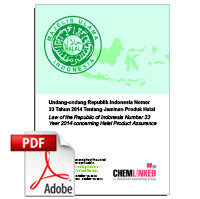 In Indonesia, all domestic cosmetic manufacturing enterprises must obtain a production license before production. The production license is divided into two classes: Class A and Class B. Enterprise which obtain a Class A license are permitted to manufacture all kinds of cosmetics while Class B are prohibited from manufacture of 1) children cosmetics, 2) cosmetics contain antiseptic, anti-dandruff, skin lightening and sunscreen ingredients. Both domestically manufactured and imported cosmetics should be notified with the Agency for Drug and Food Control before circulated on the market (those products only used for research or samples for exhibitions in limited quantities and not for trade are exempted). Individual businesses/ business entities that contract with a domestic cosmetic industry which has obtained a production license. The applicant should first register with Agency for Drug and Food Control to get an ID and password for notification application. The applicant who has successfully submitted the Template should make a payment through the designated Bank within 10 days and submit the payment proof. The applicant will then receive a Mark Product Identifier (Product ID) as a receipt for the application of notification. Once the product got notified, it must be produced and circulated within 6 months. Halal cosmetics are also a feature of the Indonesian market, because this country is a primarily Muslim country. Sale of halal cosmetics requires a Halal certificate. There is a complicated procedure to apply for this certificate.